Dust of any kind is the ruination of a flat varnish coat. One must do everything possible to keep from raising dust into the air, from where it settles into the varnish. (By the way, paint collects dust the same way and should be thought of as varnish with suspended pigments.) Always try to varnish on a day with settled weather. No matter how tight you think your varnish room is, a windy day will cause trouble. If you are working in a garage or area that cannot be completely cleaned out, you can temporarily tape or staple plastic sheeting to the walls and ceiling. Painter's drop cloths are quiet inexpensive. For the varnish to properly adhere, the hull, not just the air around the boat, must be a minimum of 65 degrees Fahrenheit. If you must heat your finish room, do so day and night for a few days before varnishing until the hull is up to temperature. Shut your heating equipment off during actual varnishing. Prepare the boat by removing all of the chrome hardware. First, take pictures to ensure proper replacement. Mark the chrome pieces on their bottoms because two "identical" pieces will very often have differently spaced screw holes. Keep them with their screws in Zip-Loc bags so replacement is quick and easy. Any deck hatches should be removed and done separately on sawhorses. After the hardware is removed, wash all surfaces well with a few drops of mild detergent, such as dish soap or boat soap, per gallon of water and rinse well with fresh water. This step removes any wax products that may have been used as a bond-breaker for the hardware. 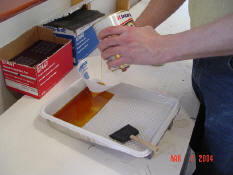 Varnish does not like anything waxy and will creep away from it after application, so make sure the surfaces are clean. It is possible to lift the outer edge of the upholstery hidem (the hidem strip is meant to hide the upholstery edge and the staples that hold on the strip itself) and tape under it to the edge of the staples. Pulling the tape taut at the corners helps to hold the hidem edge up so that you can varnish up to, and help seal, the staple holes in the wood. I personally prefer to remove the hidem carefully with a staple puller and and put it back in place after the varnish job is completed. When prepping for varnish, I also like to tape pieces of Visqueen plastic completely across any cockpit openings. 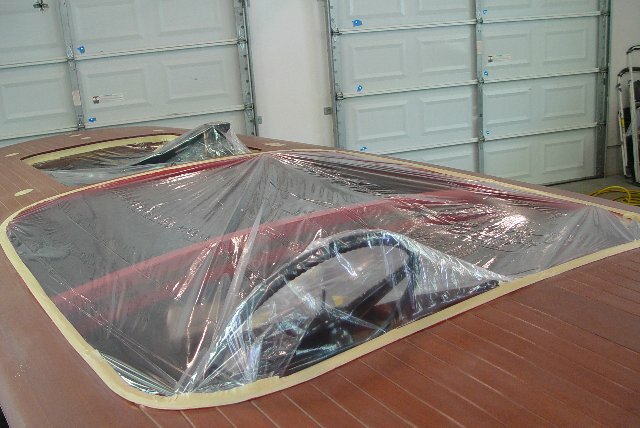 This protects the upholstery from spills, keeps dust from coming out of the cockpits, and helps to hold the upholstery edge up away from the wood. Next, the waterline should be taped off, with paper masking applied below that, to protect from drips. Make sure that the paper masking falls away from the hull, rather than being taped around the edge of the chine to the bottom. This will allow any drips to fall away from the boat to the floor. 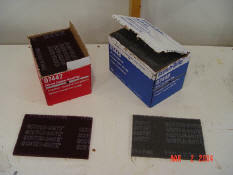 Tape over any holes in the deck, such as vent holes, to avoid dripping varnish into the bilge. This also allows smooth brush strokes to follow right over the tape masking the hole and helps to keep your brush from picking up dust and transferring that to the deck surface. 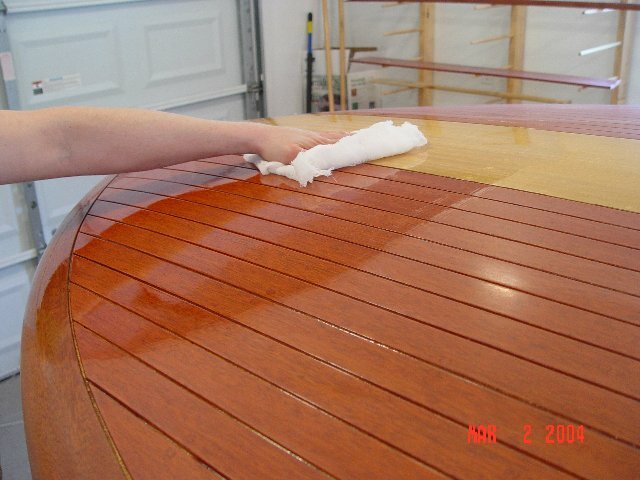 If you are varnishing only the deck, or the hull, you can separate the two by taping and masking the line where the topsides sheer plank meets the lower edge of the covering board and where the forward edges of the transom planks meet the after ends of the hull topsides planks. This transition will be hidden under the metal sheer rub rail and the metal transom guards. The transom is usually varnished when doing the deck because there is rarely trim to cover the transition. 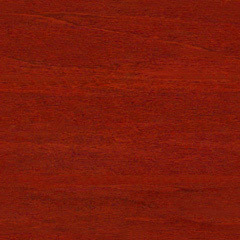 If your varnish coats are sound (no flaking or peeling), the surface can be prepared with 180- to 220-grit sandpaper. Be very careful to properly prepare and clean old finishes, even if only a season old. Varnish is degraded by ultraviolet light. It would be a shame if the transition coat did not get a good hold and you wasted all of your preparation and hardware-removal time. If many years have passed between refresher coats, it may be wise to sand the old surface well to remove any degraded varnish. 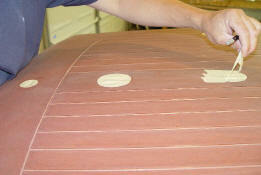 If possible, move the boat outdoors for sanding and washing. This will help keep dust from being introduced to the finish room. 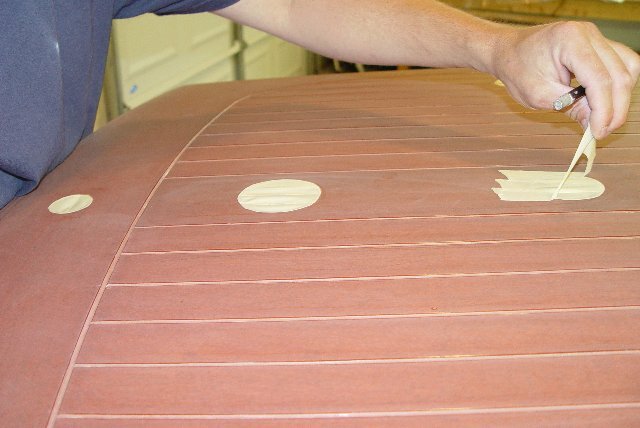 Recent or built-up coats of varnish can be prepared with a 3M Scotch Brite pad, available at most auto-body supply stores (#07447 is equivalent to 180-grit and #07448 is equivalent to 220-grit). Do not steal the cheap green ones from your kitchen---these are not produced to uniform specs and will scratch the varnish too deeply. You can can de-gloss the entire hull by hand with the Scotch-Brite pad and a rubber backing block. 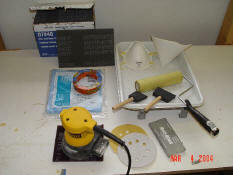 If they are hook-and-loop pads, they can also be used with an electric random-orbit sander. An 18-foot boat takes about 20 minutes with the machines. Because the Scotch-Brite pad wears down the tiny plastic hooks on a sanders hook-and-loop surface, I use an interface pad (#05773 for a 5-inch pad and #05774 for a 6-inch pad) between the backup pad on the machine and the finishing disc. These are made to provide extra cushion to allow for contour sanding, but they also eliminate wear and tear and are cheaper and easier to obtain than a replacement backup pad for your random orbit sander. If your varnish requires a more aggressive approach, or if you want to flatten the previous coats, you can use a hand block or the above machines with 220-grit to 400-grit sandpaper. Use only Scotch Brite pads on corners, rounded surfaces, and in deck-seam grooves. Sharp exterior edges should not be sanded at all, as it's all to easy to burn through the varnish and stain all the way down to wood, even with the finer sandpaper grits. After the entire surface has been de-glossed vacuum everything, especially hardware holes and deck-seam grooves. If you are working outside, you can blow it all off with air pressure. (Do not do this in your finish room. It will fill the room with dust that you will stir up later during varnishing.) Do not use air pressure unless you have adequate, in line oil filter on your compressor line. Oil spots will make a mess of your varnish coat. The surface can now be washed again with water and dried. While washing the hull, hose down the floor surrounding the boat so you don't kick up dust while you work. Prior to varnishing, the surface should be wiped with a clean, lint-free cheesecloth lightly soaked with whatever thinner is recommended on your varnish can. This chemically prepares the old varnish to bond well with the new coats. After the thinner is dry and immediately before application of varnish, the surface must be very lightly tacked off to remove the last bits of dust. Tack cloths are usually sold as cheesecloth impregnated with a waxy substance that collects and holds the dust. These must be very lightly wiped in one direction only. Do not press hard or wax can be transferred to the surface and the varnish will not adhere to that spot. The waxy substance will change the surface tension of the liquid varnish, resulting in a "fisheye" where it creeps away from the wax. I recommend DuPont Sontara cloths available from auto-body supply stores. These have no sticky residue of lint and are snapped open to activate. In addition to the boat, it is wise to prepare yourself, too, so as not to introduce dust to the varnish you apply. Take a shower and if it is warm enough, wear only shorts. It is amazing how much lint and dust comes off a T-shirt. You can buy a paper or Tyvek paint suit for about $10 at the auto-body supply store. And always remember to wear any safety gear necessary for any of the above operations: safety glasses, ear protection, and respirator. Varnish, even from a brand-new unopened can, should be poured through a fine, paper paint filter. Just taking off the lid can introduce to the liquid small amounts of dried varnish that have set up beneath the lid. All brushes, rollers, and anything else that comes in to contact with your varnish coat should be carefully cleaned, at least with air pressure. A fine powder is used during the brush manufacturing process so that the machinery handles the bristles well. No matter how expensive the brush, it must be washed before all uses, including the first. I use warm water with a mild detergent, spin them clean with a brush spinner, and hang them up to dry with a paper wrapping to hold them in shape. Foam rollers and brushes can likewise have a dusty residue left over from the manufacturing process. I clean these with air pressure.